NASA astronaut Donald Pettit has spent 370 days in space, orbiting the Earth more than 3,000 times while traveling 82 million miles. The space traveler has also taken nearly a half-million photos to capture the awe of his journeys. 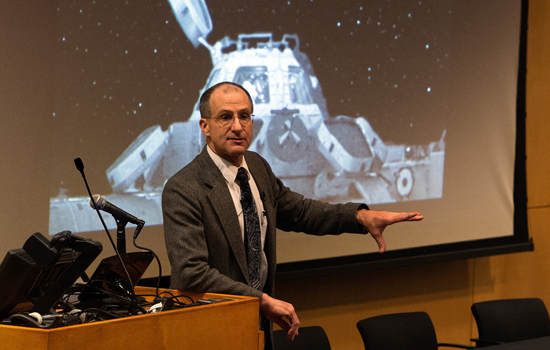 Pettit will present his lecture “Astronauts’ Guide to Photography in Space” at 6 p.m. Monday, April 13, in RIT’s Webb Auditorium. The event is free and open to the public. Pettit’s innovative photographic work and passion for low light photography has changed the way we see Earth from space. He is a veteran of three space flights. He has lived aboard the International Space Station for 5 1/2 months during Expedition 6, was a member of the STS-126 crew, and again lived aboard the station for 6 1/2 months as part of the Expedition 30/31 crew. He has also logged 13 hours in space walks. Millions of photos are used as part of the scientific data set for NASA. Pettit will share the photographic challenges faced by astronauts on board the International Space Station as well as some of the ingenious solutions he developed during his time in space. “Frontiers are interesting places. They offer experience outside of the norm where the answers are not found in the back of the book. You have to figure things out for yourself,” said Pettit, whose fascination with photography began in middle school. Pettit will remain on campus April 14 and visit with students, faculty and staff in the College of Science, the Chester F. Carlson Center for Imaging Science and the College of Imaging Arts and Sciences. Part of the visit includes meeting with student researchers who will examine ways to reduce damage to photos caused by cosmic rays in space. RIT alumnus Peter A. Blacksberg ’75 (photography) was instrumental in arranging Pettit’s visit. To learn more of Pettit’s photographic work and time-lapse movies, go tohttps://www.youtube.com/watch?v=rwt3kMivZk4. The event is sponsored by the College of Imaging Arts and Sciences, the College of Science, the Office of Development and Alumni Relations and University News Services.